Ross offers complete mixer packages for fast and efficient dispersion of bulk solids in large batches. 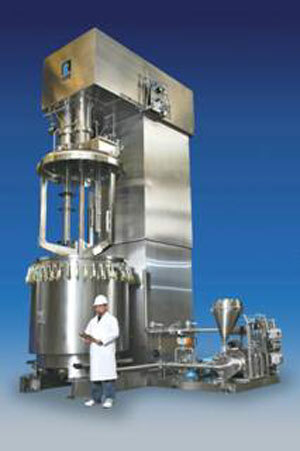 Pictured is a 1000-gallon Dual-Shaft Mixer with Inline Solids/Liquid Injection Manifold (SLIM) and Recirculation Skid. At the heart of the process is the SLIM Technology which utilizes a specially engineered rotor/stator that generates a powerful vacuum for drawing solids into the mix chamber. Bulk solids are charged into the SLIM’s feed hopper while liquids are introduced into the batch mixer. The Inline SLIM mixer acts like a pump and recirculates the liquid; when the solids inlet valve is opened, the rotor draws powders into the incoming liquid stream and expels the resulting dispersion through the stator openings at high velocity. All solids are quickly injected while the liquid is relatively low viscosity. As the product thickens, the agitators in the Dual-Shaft Mixer are engaged to incorporate minor ingredients and finish the mixture. For applications where peak viscosity is significantly high, a supplementary pump may be supplied to continue recirculating the batch material and transport it to downstream equipment at the end of the mixing cycle. The SLIM is ideal for high-volume and high-throughput injection of powders, pellets or granules while preventing the formation of agglomerates and “fish eyes”. Material handling is also simplified as solids are charged at floor level instead of being carried up a mezzanine to be scooped or dumped into the batch. In addition, the sub-surface addition of solids eliminates the problem of floating powders frequently encountered in conventional stirred tanks. The SLIM technology differs from eductor-based systems which combine solids and liquids inline but before they can be actively mixed, thus often suffering from clogging issues.